Google has made a couple of pleasantly surprising moves recently. For starters they decided to reveal the open source code for the I/O 2014 App - originally built to guide attendees around the event - in order to help developers code for their own projects. And at a recent Google developer conference, the star of the show wasn't the smart watch or Android on the big screen TV - it was a piece of cardboard. Notorious (at least in this office) for their inability to design and build physical objects (say, a mask with a handle, or a picture frame), the template for this project actually works. The project - predictably called Google Cardboad - was created as a way to bring virtual reality simulation to the masses. It's an alternative to the highly-anticipated Oculus Rift, and is available to anyone with an Android smartphone and access to cardboard. Google has come up with a low cost alternative, that gives the experience of virtual reality but without the headache. The cardboard folds into the shape of a headset, at the front of which you put your smartphone. Using orientation sensors and a split screen, the DIY device gives the impression of being in a 3D environment. If building the mask yourself you will have to download the app, however if using one of Google's own made the app is launched automatically using a near-field communication (NFC) sticker tag. Blocking off other visual stimuli around the eyes, the experience is visually immersive and the user is free to move around merely by looking in a certain direction: you can do a tour of the Louvre, take a fly around Chicago, and even zoom up into space! 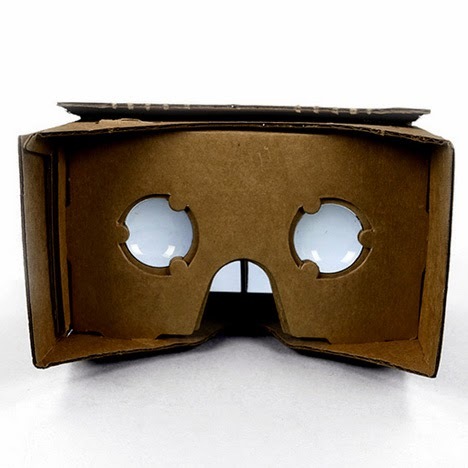 Just as it has handed out the source code for the I/O 2014 app, Google intends for this project to spur development in the virtual reality field and is handing out the Cardboard to software developers in order to create new experiences. The hope is that VR will soon be available for all, and not only for those with their heads stuck in the clouds.